Island Peak’s south-facing aspect. The summit is accessed from the north side. Don’t be misled by the appellation: The trekking peaks of Nepal offer their share of challenging mountain climbing. Mountain Trip offers a range of objectives in a variety of regions in this culturally diverse country. All of our expeditions are combined with a trek in to the mountaineering objective and so are also accessible to fit trekkers who might like to join us as we stroll amidst stunning landscapes and sample the rich mountain cultures. 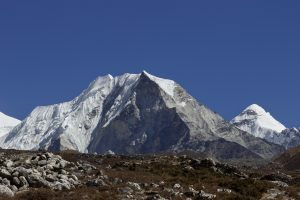 We love leading trips to the Khumbu region of Nepal, where climbers will have the opportunity to challenge themselves on the 20,305’ (6189m) Imja-Tse (Island Peak). This is a great choice for those wishing to experience high altitude mountaineering in a dramatic setting. One of the world’s great alpine walls, the South Face of the 8,516 meter giant Lhotse, provides a spectacular backdrop to our climb. 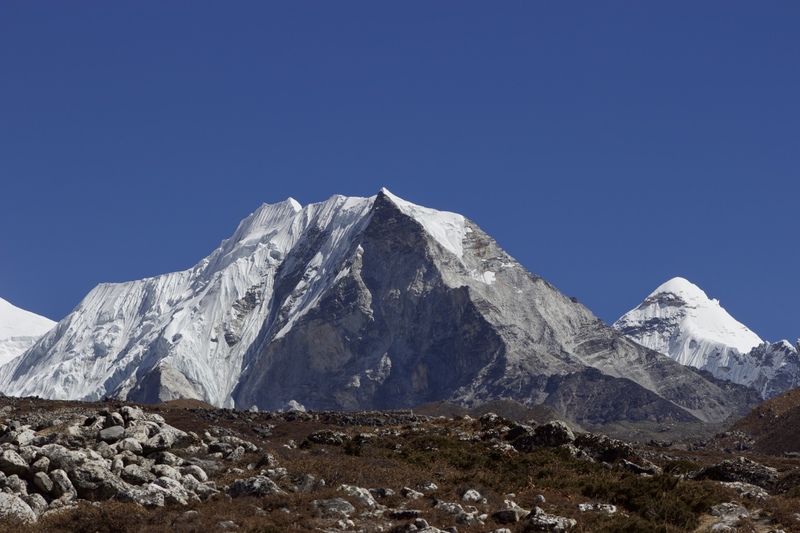 We combine the Island Peak climbing expedition with a trek through the Khumbu region to Everest Base Camp. Beginning at the airstrip in Lukla, we will explore the Sherpa trading center of Namche Bazaar and the religious and cultural center of the Tengboche Monastery. As we continue to explore the Khumbu Valley, we will stop and visit the Himalayan Rescue Association clinic in Pheriche as we further our acclimatization with some of the most spectacular hiking on the planet. Above Pheriche we hike along the massive Khumbu Glacier as we make our way toward Everest Base Camp. A memorable objective in its own right, we will make an acclimatization climb of 18,300’ Kala Pattar, a stunningly situated satellite peak with views of Everest, Nuptse and Pumori before briefly re-tracing our route back toward the Chukkung valley leading towards Island Peak. From the idyllic stone houses and fences of Dingboche we hike under the beautiful Ama Dablam toward the village of Chukkung en route to our 16,690’ Island Peak expedition base camp. Our Island Peak ascent climbs the narrow Southwest Ridge to the breathtaking summit surrounded by the majesty of Makalu, Lhotse, Ama Dablam and the holy peak of Cho Polu. After savoring the rewards of our efforts, we descend to our Base Camp and ready ourselves for the journey back to Lukla. Participants in the Island Peak climbing expedition should have some basic mountaineering experience and be good physical condition. Though we will only be hiking with day packs, trekkers also need to be in good shape as the mountainous terrain that creates such majesty in the Khumbu region lends itself to rugged hiking. Day 24: Flights Home: ! The following is a general list of required gear for climbing Island Peak with Mountain Trip. Climbers joining us on an expedition will receive an updated, comprehensive equipment list that may supersede this list. Many of the items on the list need to fit you well in order for you to fully enjoy your experience on the mountain. Please plan ahead with equipment purchased for your trip so you can be certain that your gear fits you well. the long hike up to Namche Bazaar is not the place to discover that your day pack is too small for your trekking kit, or that your hiking shoes give you blisters. Recommended items reflect the opinions of our guides. We have used and have faith in all of our recommendations, but they may not necessarily fit or work for you. Please follow this list closely and do not hesitate to call us for clarifications or to solicit an opinion about anything you are considering. There is often a decent selection of gear available in Kathmandu, but it is really hit or miss, so please do not plan to purchase items in Nepal. Only bring quality gear that is in very good condition, as it will all get tested. Mountain Boots Insulated boots are a must; however, they can be insulated single boots, or double boots (triple boots are overkill for this trip). Single boots climb better, but require a bit more care to dry them out after wearing them for an acclimatization climb. It can be warm down low, but remember you'll be climbing to over 20,000 ft! Light Hiking Shoes or Boots The days spent hiking require waterproof, well broken in boots or hiking shoes. Trail running shoes will work, if you are comfortable using them, as we will only carry daypacks. Crocs Crocs make a great lodge/camp shoe. They are lightweight and versatile, you can wear them with a sock in the evening, and even use them for a shower shoe. Down Jacket A nice simple down jacket that you can put on over your light puffy jacket on a cold night. This doesn't need to be a big 8000 meter down parka. Lightweight Softshell Trekking Pants A lightweight synthetic softshell pant is a great layer that you'll wear every day on a trek. These are water resistant, breathable and comfortable in a wide range of weather and temps. 0 degree Sleeping Bag You'll want a bag rated to about 5 degrees Fahrenheit and warmer if you tend to sleep cold. Down or synthetic will work fine, although down is lighter and more compact for traveling and packing. Trekking Day Pack You will want a day pack of around 30 liters of volume for carrying your extra clothing, food, water, etc. for a day of trekking. [post_excerpt] => Insulated boots are a must; however, they can be insulated single boots, or double boots (triple boots are overkill for this trip). Single boots climb better, but require a bit more care to dry them out after wearing them for an acclimatization climb. It can be warm down low, but remember you'll be climbing to over 20,000 ft! [post_excerpt] => The days spent hiking require waterproof, well broken in boots or hiking shoes. Trail running shoes will work, if you are comfortable using them, as we will only carry daypacks. [post_excerpt] => Crocs make a great lodge/camp shoe. They are lightweight and versatile, you can wear them with a sock in the evening, and even use them for a shower shoe. [post_excerpt] => A nice simple down jacket that you can put on over your light puffy jacket on a cold night. This doesn't need to be a big 8000 meter down parka. [post_excerpt] => A lightweight synthetic softshell pant is a great layer that you'll wear every day on a trek. These are water resistant, breathable and comfortable in a wide range of weather and temps. [post_excerpt] => You'll want a bag rated to about 5 degrees Fahrenheit and warmer if you tend to sleep cold. Down or synthetic will work fine, although down is lighter and more compact for traveling and packing. [post_excerpt] => You will want a day pack of around 30 liters of volume for carrying your extra clothing, food, water, etc. for a day of trekking. All deposits for Island Peak expeditions include a non-refundable $750 administration fee. Final payments for expeditions must be received 120 days prior to the Team Meeting Day. Any cancellation 120+ days before your Team Meeting Day will be refunded in full, less the administration fee. If you cancel 120-90 days before your Team Meeting Day, you are eligible for a refund of 50% of any monies paid, less the deposit. If you register for a climb within 90 days of the Team Meeting Date, expedition fees will be due in full to secure your spot on the team. Mountain Trip Guide. Your expedition will be led by one of our guides with extensive 6000 meter experience. Sherpa support. We have an all-star team of Sherpa who work with us in the Khumbu. Custom expedition dispatches so your friends and family can follow along on your adventure. Trip Cancellation Insurance. US and Canadian residents can contact us for insurance options. We will designate a specific Team Meeting Day for your expedition. Transportation to the meeting point on your Team Meeting Day is to be provided by you. You must arrive in time to be ready to participate in a team meeting at the appointed time on the Team Meeting Day for your expedition. Expedition climbing is very dynamic and we will provide you with a recommendation as to when you should book your flights to and from your destination. We suggest you book a ticket that allows you to change your flight with little effort or cost.